Welcome to the brand-new Stamp Collecting Spot! As you have probably noticed, I’ve added several new features which are available to registered users only (register here). I thought it would be a good idea to explain, with step-by-step walkthroughs, exactly how each new feature works. Fill out each form, then click the Register button. A confirmation email will be sent to the email address you registered with. Open the email (it should be titled “Please activate your account”), and click the activation code within. You’re now the newest member of Stamp Collecting Spot! Once inside, you’ll be redirected to your profile page. I’ll show you how to set it up. Your profile is a place where people can learn more about you, see your latest activity, and view your friends and followers. Much like a Facebook or Twitter profile. So, you’ll want to make it look nice. First off, you’ll want to upload a profile and cover image. 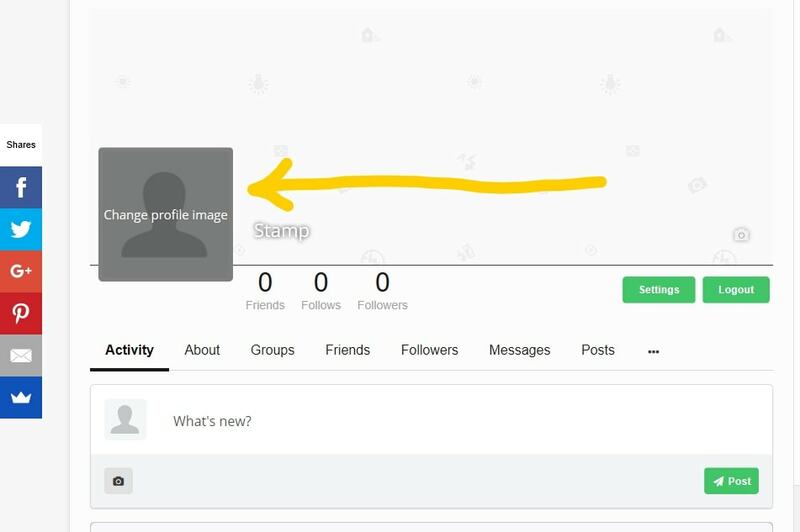 To add a profile image, click on the default one, then hit “Upload photo”. Choose an image from your computer as your profile image. Try choosing one that’s under 100 KB. If you don’t have any that small, consider resizing it and compressing it with this tool (for JPEG) or this tool (for PNG). Compressed images will help keep Stamp Collecting Spot loading fast. Too many large images will slow it down considerably, hurting the experience for everyone. Next, you’ll want to upload a cover image. Make sure this one is small as well. It doesn’t have to be under 100 KB, but it would be good if it were fully compressed. Next, I’ll talk about the first tab in your profile: Activity. Activity is anything that you post on Stamp Collecting Spot, whether it be text, an image or a video. 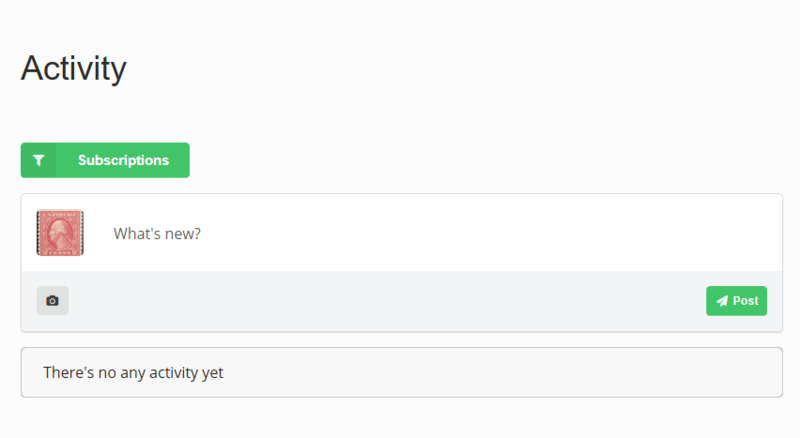 Under the activity tab in your profile, you’ll see a box that says “What’s new?”. You can type something in there, and/or add media by clicking the gray camera icon to the lower left. Once you’re satisfied, hit “Post” and it’ll be visible to the world. If you have a Facebook, Twitter, or other social media account, activity should be nothing new. It’s essentially the same as a Facebook post or a tweet on Twitter. 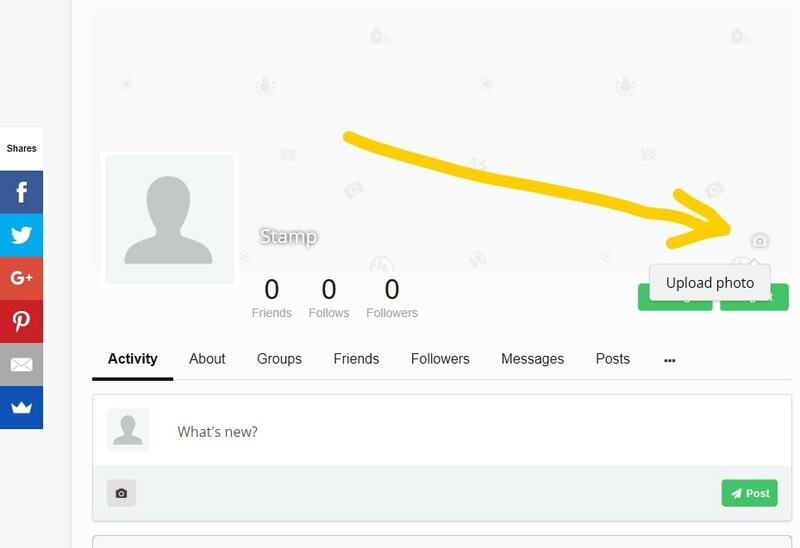 Whatever you post on your activity will show up in your profile activity feed and in the activity feeds of your followers. Now that that’s out of the way, let’s continue updating your profile. Under the “About” tab in your profile, you’ll see 3 sub-tabs: Main, About, and Contact Info. You can edit each field that shows up next to these tabs. Under the Contact Info tab, you’ll notice fields for your website and various social media accounts. There are no fields for an address, email, and phone number for obvious reasons. If you still want to display this info, feel free to add it in the “About Me” section. Just be aware that you might receive some spam from shady visitors and robots. Also, if you need to share personal information with someone (like your email or phone number), just private message them. Next, let’s move on to your account Settings. Click the green “Settings” button next to the Logout button. 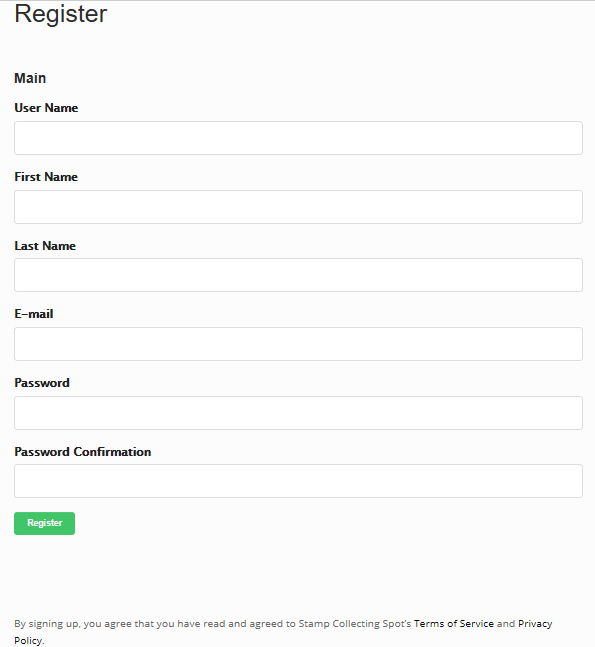 In the first section, “Account”, you’ll be able to change the email address associated with your account, change your account password, or delete your account. 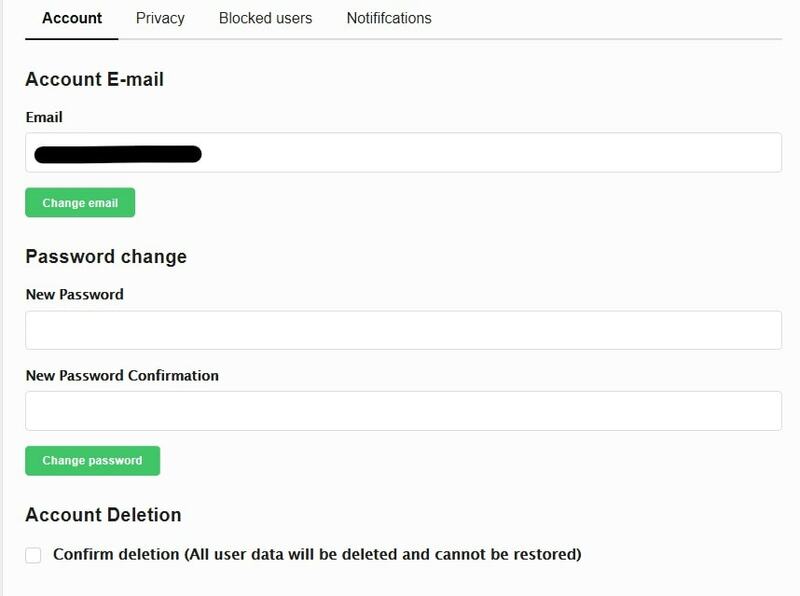 The next section, “Privacy”, allows you to change such things like who can view your profile, who can private message you, etc. The next section shows any users you’ve blocked. Hopefully no one will have the honor of showing up in there. The final section allows you to change your notification preferences. I think the rest of the tabs on your profile are rather self-explanatory. However, if you do need help understanding any of them, please leave a comment below and I’ll be happy to help! Now, let’s move on to the “Activity” page. This page is simple, but very powerful. Basically, it’s the central hub of Stamp Collecting Spot. With the default “Subscriptions” filter, it shows you all the activities of the people you follow. If you click the Subscriptions button, you’ll see a list of different activity filters. Selecting one will return only activities that match your selection. For instance, selecting “Popular” will sort all site-wide activities by their number of likes, and selecting “Photos” will only show posts with photos. You can also post directly to the Activity. However, only people who follow you will see your post in the activity feed. Your post will only show up to your non-followers when they filter the activity feed by “Site-wide”. Here at Stamp Collecting Spot, we have lots of guidelines in place detailing what’s allowed and what isn’t. Check out our Terms of Service for more information. Basically, if you’re not sure if you’re allowed to post certain content – you probably aren’t. If it’s questionable, just don’t post it. This site is supposed to be a family friendly place, and will have young users. That said, some bad posts may still slip through. If you find any of these, PLEASE report it and it will be dealt with. To report a post, click the 3 horizontal dots, then hit “Report”. Groups are a great way to, well, form groups! 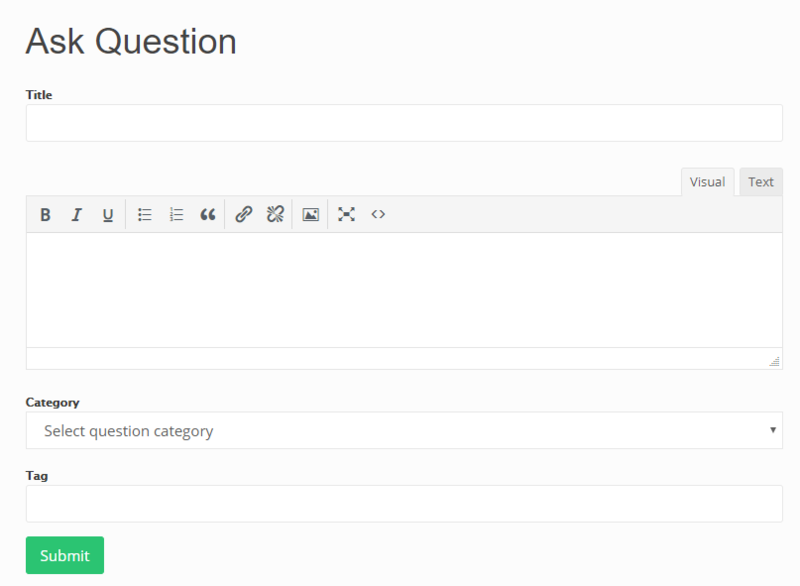 For example, you can create a group around your collecting interest – be it precancels, postal cards, or Romanian CTOs. 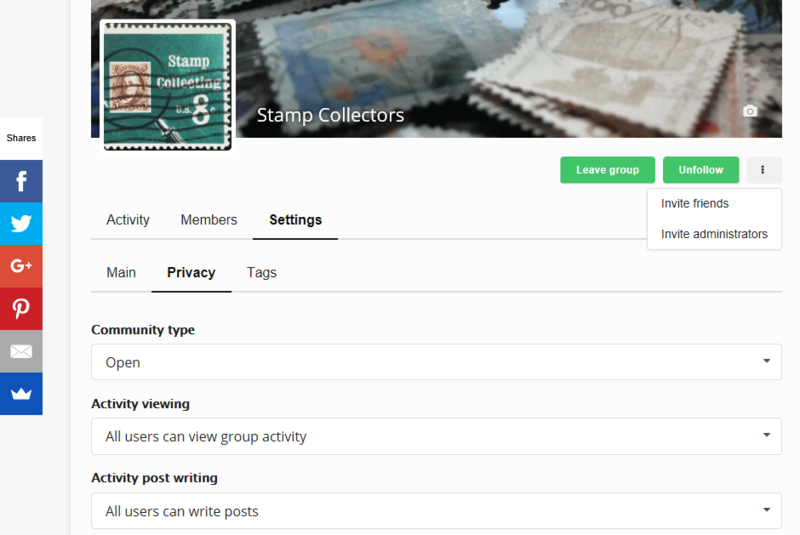 Or if you’re a stamp dealer, you can create a group for stamp dealers only. It really doesn’t matter what type of group you create, as long as it has something to do with philately! Groups have an activity page, a members page, and of course, a settings page. On the settings page, you have the option to update the group name and description. I highly recommend against changing the name though, as that could cause confusion and will create broken links. So, make sure you name your group right the first time around! You will also see a page titled “Privacy” in the group settings page. The privacy page allows you to set different privacy levels for your group. For example, you can leave it as an open group – meaning everyone can see it and anyone can join – or, you can make it a closed group where everyone can see it but no one can join – or, you can even make it a private group where no one can see it or join (except the people you invite). As a group administrator, you can invite any of your friends on Stamp Collecting Spot to join your group – regardless of the group’s privacy level. 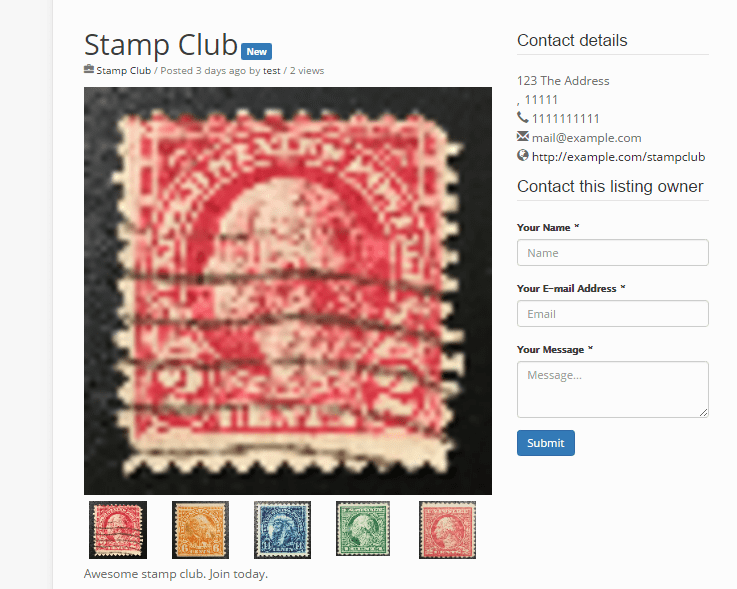 So for example, if you just created a private group for your stamp club, you can use the invite feature to send invitations to other members of Stamp Collecting Spot who are also members of your stamp club (you first have to be friends though). Need help with something? As long as it relates to stamps (or your Stamp Collecting Spot account), feel free to ask a question on the Q&A page. The business directory is an excellent way for philatelic businesses of any kind to advertise and gain more exposure. It’s also 100% free; there truly are no costs involved whatsoever. All you have to do is fill out the listing form, and submit it for approval. Once approved, your listing will be live and visible to the world. Your listing page includes a description, contact details and a contact form, and supports up to 5 images, a YouTube or Vimeo video, and a Google Map. As of now, the business directory is ordered by newest to oldest (newest listings show up at the top). That way, it will be kept fresh and every listing will get a turn being #1. Well, there you have it! 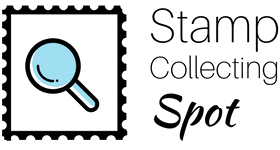 I’m extremely excited about the launch of Stamp Collecting Spot 2.0, and hope I’ve done a decent job explaining all the new features. If you have ANY questions or thoughts, please leave a comment below and I will be sure to get back to you. Next PostIs Stamp Collecting Dying?